Waterfall Island – One gorgeous design that is growing in popularity among homeowners is a waterfall island. This design consists of a countertop that flows elegantly down both edges of the island and stops at the floor. Choose a stylish-looking stone such as marble in classic white with gray veining for an awe-inspiring appearance. Match this stone with medium gray cabinetry for a coordinated look that everyone will love. V-Shaped Island – Another chic design is a V-shaped kitchen island, which looks especially fabulous if you have an open-concept layout. This shape of island adds a look of depth to your kitchen and makes it appear more spacious. Select a granite countertop with two or more colors intermingled in the stone that will match well with the rest of your decor. Rich-looking, wooden cabinetry on the inside portion of the island and horizontal wooden planks on the outside of the island will create a distinctive appearance. Oval Island – If you or any of your family regularly bump into the edges of your island and end up bruised, you might want to consider a design with a smooth, oval top. This unique shape will add safety as well as a very modern appearance to your kitchen. 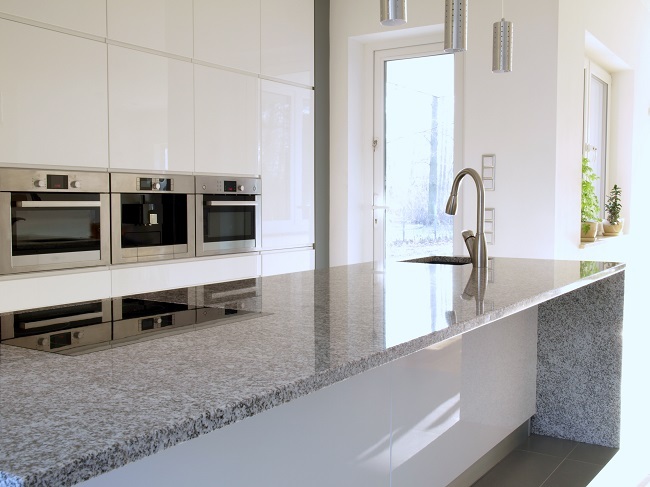 Choose a solid-colored quartz countertop with a little sparkle sprinkled in for a spectacular look. Update the look even more with an unexpected color choice for your island cabinetry such as black, yellow, or even red. For more information about updating the look of your kitchen or renovating another area of your home, please contact us today. Our team of dedicated tradesmen will provide you with a hassle-free renovation process and a quality outcome.